Early this morning I sat wrapped in a blanket on the frosty back patio of Querencia. The sun rose over Pikacho Peak. Ravens and chickadees chattered, dogs barked, coyotes scattered, footsteps crunched on snow. The highway woke up then too, commuters zooming through the valley to Santa Fe. Each engine momentarily obliterating the birdsong and the silence. 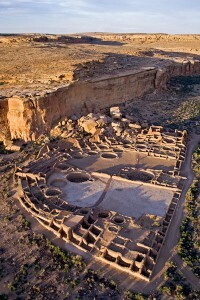 I saw in the sun’s rays an image of Chaco Canyon, the ruins of a proud civilization that thrived and peaked 800 years past. It took 300 years to build it, twelve generations, each individual life dedicated to constructing just that wall, that doorway, that kiva. Four-lane highways to nowhere. Two hundred thousand massive timbers hand hauled from distant forests. All to build a vast monument to hubris and the illusion of permanence. All in the end, burned, abandoned and collapsed. And I took comfort in the truth that this too shall pass. One day this highway will crumble to silence. The sun will still rise and the birds will keep singing, and the coyotes will leave footprints in the snow.